Social media is something that seems to be taking over everyone’e lives more and more, not just personally, but professionally as well. More and more people are gaining access to mobile devices which means more and more people have access to social media information anytime and anywhere. Posting on social media has become such a common activity that some people do not even realize there should be boundaries and what those boundaries should be. I’m sure I can’t be the only person who checks their phone as soon as they get up in the morning (am I right?!). Most of the time I’m not even out of bed yet and my phone is in my hand. It is also always within reach to me. That just seems to be the way it is today with everyone, social media is always within arms reach. So why do we not think before we share when everyone can see anything we post at any given time? There are some people that I know that will post anything and everything they are doing on social media. Personally those people drive me crazy sometimes! But what they don’t consider is potential employers seeing what they are posting. They could post very personal information online that should have probably been kept private. They use social media as a digital diary of some kind (aren’t diaries suppose to be private?). Another thing I see a lot with people my age (20’s) is pictures that are not so appropriate such as pictures at parties. It might seem fine to them at first when they post these things because they may think “well it’s my page I’ll post what I want”, but more and more employers hire people (or don’t hire people) based on what they see on someone’s social media pages. 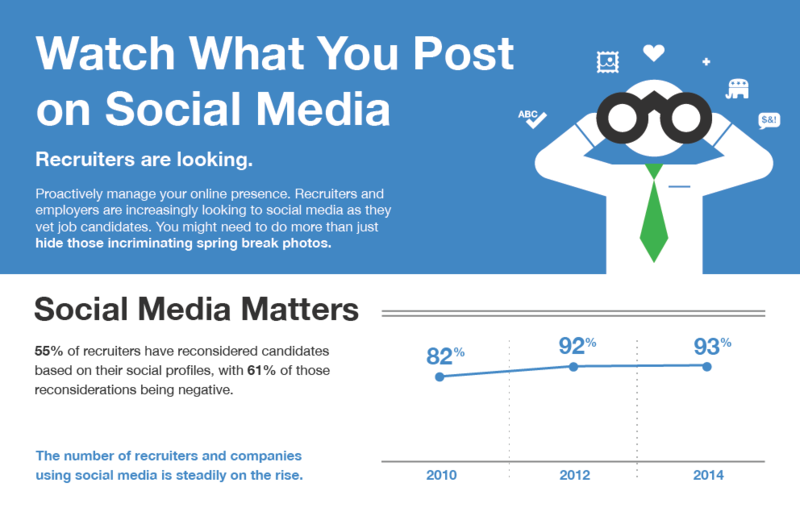 As of 2014, 93% of employers use social media when considering new hires. Social media sites are really strong tools that can be used for many different things that benefit us such as learning and social networking, but sometimes people do not use it wisely and it can end up hurting them. One thing that people need to start considering is thinking before they share. We need to remember that everything we share online leaves a digital footprint that will probably never completely disappear. Anyone, anywhere, at any time can have access to our personal information in the matter of seconds with the power of social media, the internet, and mobile devices. Some people’s mistakes in using social media can be beneficial to others, but hopefully in the future, people will think more about this and considering thinking before they share. I thought this was a really great argument and a great read! It is important that we all recognize that everything we post on social media leaves an “electronic footprint.” I definitely agree that a lot of people do not consider this when they treat social media accounts as a personal diary. I really enjoyed reading both of your discussions. I actually used to be a recruiter, and we would always take advantage of looking people up who we were thinking about hiring on the Internet. I think that it is a great way to learn more about the person you are potentially going to hire. It helps avoid making a bad hire. I don’t really think there should be any laws put in place against what employers can look up on the Internet. I think people must be smart about what they make public.